Cornfed Announces Season 8 Dates! 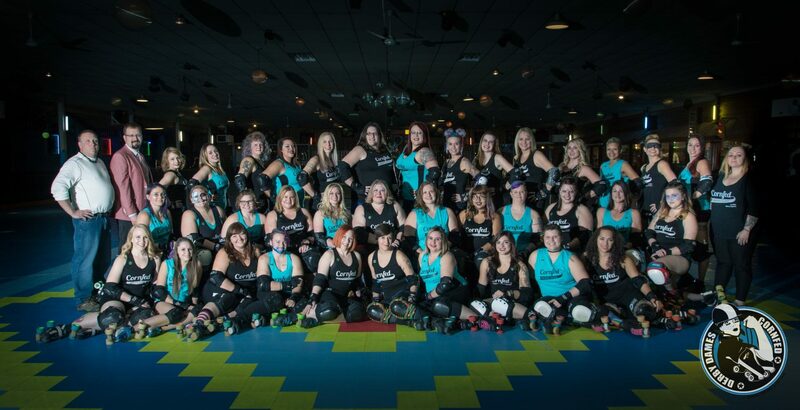 Muncie’s own Cornfed Derby Dames are gearing up for an action packed eighth season beginning in February. In 2017, Cornfed represented Muncie in many home and away games and tournaments throughout the Midwest. The team is now ranked 123 out of 339 international roller derby leagues in the Women’s Flat Track Derby Association (WFTDA). The Cornfed All-Stars and Muncie Missfits now make up a league of over 40 active members. The first home bout of season seven will be Sunday, February 25 at Gibson’s Skating Arena, 2610 S. Mock Ave. Doors open at 1 p.m. with a 2 p.m. start time. Cornfed will take on Naptown Roller Derby of Indianapolis, IN in a double header versus the Warning Belles and Third Alarm. Admission is $12 per person at the door, $10 in advance through Brown Paper Tickets, or from any Cornfed Derby Dame. College students, military personnel, veterans, firefighters, and EMT’s are just $8 with an ID and children ages 10 and younger are free with the purchase of an adult ticket (limit two children). Snacks and non-alcoholic beverages are available at the concession stand. A portion of all bout proceeds in 2018 will be donated to A Better Way Services. In addition to their four home games, Cornfed will travel to Roselle, IL to play the Dupage Derby Dames on March 10. The Cornfed All-Stars will participate in two tournaments this season: K-Town Shakedown from April 27-29 in Kalamazoo, MI and the Midwest BrewHaha from June 1-3 in Milwaukee, WI. Due to the high costs of travel and lodging, the dames are accepting donations from fans online here. If you or your business are interested in sponsoring the league this season contact cfddmonies@gmail.com for more information.